My coverage of New Zealand wine in recent years has focused mostly on Sauvignon Blanc and Pinot Noir, the country’s most consequential categories. I cast a wider net this time around, as my two weeks in New Zealand in late January and early February allowed me to taste a broader range of varieties at a number of the best addresses. I was also able to sample many other wines at a series of group tastings and events, some of them centered around the Central Otago Pinot Noir Celebration in Queenstown and the International Sauvignon Blanc Conference in Blenheim during the peak of New Zealand’s summer. I followed up by tasting (and retasting) many additional wines in New York City in February, March and April. On this trip, I spent time on Waiheke Island, in Hawke’s Bay, in Marlborough, and in Central Otago but also tasted most of the top wines from other regions such as Martinborough in Wairarapa, the Waipara Coast on the South Island, and Nelson (as well as a few wines from North Otago). In the history of New Zealand’s burgeoning wine industry, Martinborough evolved first as a promising source for Pinot Noir in the late ’80s and ’90s. But in the last 25 years, and especially since the turn of the new century, it has been the stunning success of Marlborough’s Sauvignon Blanc that transformed the New Zealand wine landscape. Meanwhile, Central Otago, in the middle of the South Island, had barely existed as a source of high-quality Pinot Noirs for the outside world until the year 2000; but rapid growth in vine plantings and wine quality have made Central Otago the second big success story in New Zealand’s modern age of viniculture. And Syrah has found a home in poorer soils in Hawke’s Bay and Waiheke Island, which typically produce lower yields and can more frequently ripen their fruit. New Zealand is a temperate island nation in the middle of a vast sea, but its grape-growing areas are typically dry as nearly all of the country’s vineyards are planted on the eastern side of the North and South Islands. They are protected to varying degrees from cold southwesterly winds and precipitation by a chain of mountains that runs through both islands from the top to the bottom of the country (the west coast is far rainier). Other than Central Otago, located in the mountainous center of the South Island, and the only continental climate among wine regions, the overwhelming majority of New Zealand’s vineyards lie within 10 or 12 miles from the moderating influence of the sea. 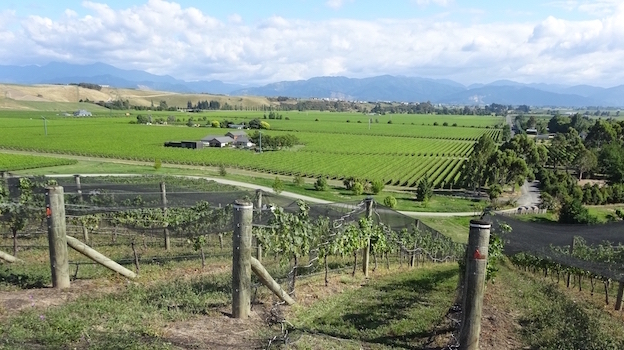 The geographic center of New Zealand wine production includes the area of Hawke’s Bay on the North Island to Marlborough on the South Island. North of that (in the area of Auckland), the climate is essentially subtropical, with more heat and sunshine during the growing season, generally higher humidity and less risk of frost. South of Marlborough, the climate is distinctly cooler, and in continental Central Otago, the world’s southernmost fine-wine region, it’s far more extreme. Coastal areas enjoy mostly moderate temperatures but can be very dry; and wind is often an issue during flowering. In the farther-inland sections of Hawke’s Bay and Marlborough, there’s greater diurnal temperature variation and frost is more of an issue. Heat waves are rare in New Zealand’s coastal areas. The most serious threats to grape-farming in New Zealand are frost in spring or fall and the odd tropical cyclone during the summer months that can bring strong wind and heavy rain, especially to coastal areas. Summer drought can also be an issue in such areas as Hawke’s Bay and Marlborough, areas that enjoy high total sunshine hours during the growing season. 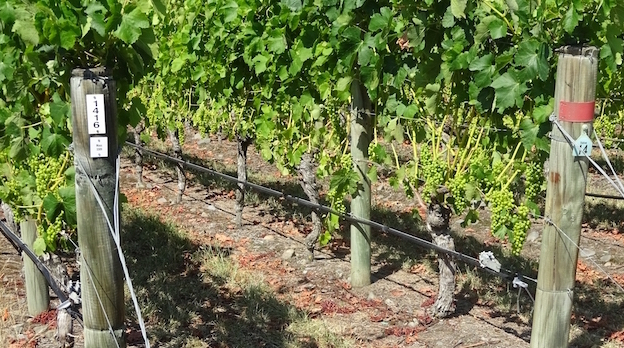 Many vineyards require irrigation during dry spells. Rain totals are generally greatest around Auckland and then progressively lower heading south, with Central Otago the driest major wine area in the country, having as little as 12 inches of rain annually. Geologically active New Zealand sits on the boundary of the Australian and Pacific plates. Although its oldest rock formations date back as far as 500 million years, most of its surface rock is less than 100 million years old. Its soils are even younger. On the South Island, since the end of the last glaciation period 10,000 years ago, large amounts of alluvial material and loess have been deposited on lowland areas. Since the 1980s, wineries have planted in lower-fertility, free-draining sites and managed their canopies to limit shading of the fruit and to force the vines’ finite vigor into ripening the fruit. Stony soils in Marlborough and the Gimblett Gravels facilitate drainage, limit vine vigor and encourage deep root systems. In recent years many of the best growers and winemakers have sought out hillside sites that are less vulnerable to frost and are less vigorous, but note that in many “young” areas, in contrast to most growing regions in Europe, there can be more topsoil on the hillsides than on the valley floor, as much of the silt and clay has not yet eroded, and there’s often better drainage at the bottom because the valley floors were once rivers. In a very short time, Marlborough Sauvignon Blanc has become one of the world’s most successful wine “brands.” Today, Sauvignon Blanc accounts for 66% of planted vineyard acreage in New Zealand and represents just over 86% of New Zealand’s wine exports by value. And Marlborough accounts for 90% of total Sauvignon Blanc plantings in New Zealand. There are some very good and sometimes highly distinctive Sauvignon Blancs made in a range of regions outside Marlborough (in fact, there’s at least some Sauvignon Blanc planted in every major wine-producing area of the country) but in terms of quantity they are obviously a drop in the bucket. Clearly, the better Sauvignon Blancs from Marlborough have proven irresistible to wine drinkers in New Zealand and around the world. The best examples offer an unbeatable combination of the pungently herbal, grassy, green-peppery qualities attributable to methoxypyrazines, and the riper notes of tropical fruits and grapefruit that come from a group of chemicals known as thiols. Too much methoxypyrazine character (which is largely a function of over-shaded clusters) and the wines can taste offputtingly green, vegetal and unripe. But with too much tropical fruit character, the wines can come across as overly exotic and flat. Marlborough's great success with Sauvignon Blanc owes to the fact that its wines manage to combine both of these characteristics in a way that other regions find hard to duplicate. And, thanks in part to generous crop levels, most Marlborough Sauvignon Blancs that are made in stainless steel are very affordable, with only a small percentage of wines retailing for more than $20 in the U.S. market and many competent examples significantly less than that. Of course, the most adventuresome producers have adopted a number of techniques to make Sauvignon Blancs that break the mold—wines that are richer and more complex, and less relentlessly fruity. 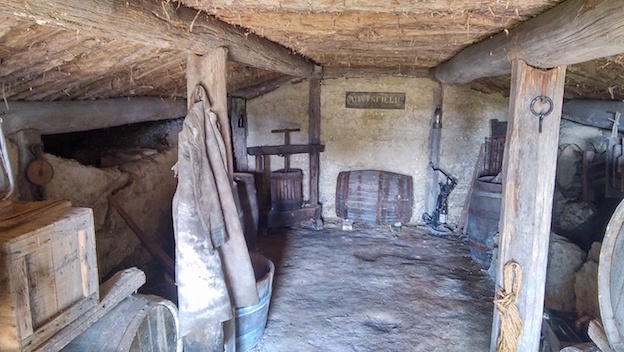 Increasingly, they are vinifying with wild yeasts, often in oak fermenters, and doing more lees stirring, aging the wines longer in barrel, and allowing a higher percentage of their wines to undergo malolactic fermentation. More recently, slightly funky, leesy, flinty, sometimes obviously reduced wines have attracted high marks from many local New Zealand wine critics, but it remains to be seen whether these wines will become popular on any important scale in export markets, especially as they are normally somewhat more expensive. These wines are typically made from lower crop levels and many Marlborough insiders maintain that when Sauvignon Blanc is too concentrated, it can become too ripe and heavy and lose its essential Sauvignon-ness. Much of the Marlborough region is a sea of green (it can also be described, less charitably, as a Sauvignon factory), as plantings of Sauvignon Blanc have been massive since the beginning of this century, up nearly nine-fold. But by most accounts, the region is within 10% of being totally planted, and that’s likely to happen within the next several years. Not surprisingly, vineyard prices have increased sharply; grape prices are rising as well, especially following the short harvest of 2015. This will increase pressure on producers who have historically competed on price, and they may be tempted to increase yields even farther. It may also offer incentives for other regions (and not just in New Zealand) to plant more Sauvignon Blanc, but relatively few producers from elsewhere are making wines with the sheer refreshment value of Marlborough Sauvignon. New Zealand also makes some of the most varietally pure, aromatic and satisfying Pinot Noirs in the world, with its best wines at the level of the finest from California and Oregon. Pinot Noir is now New Zealand’s most important red grape in terms of total plantings at 8%, but of course a distant second to Sauvignon Blanc. Martinborough, in Wairarapa, was New Zealand’s first region to gain an international reputation for its Pinot Noirs, back in the 1980s. Its old, well-drained river terraces; very cool summers and long, temperate autumns provide an ideal environment for ripening Pinot Noir slowly, without excessive sugar accumulation or loss of acidity. Martinborough’s typically well-structured Pinots nicely combine fresh plum and berry flavors with savory soil tones in a rather Burgundian way. But Martinborough has largely been supplanted in the international market by Central Otago, which only burst on the international wine scene around the turn of the new century (as recently as 1997 there were just 500 acres of vines planted in the region) and is now enjoying its second gold rush (following the real one in the 1860s). In the past 15 years there has been an explosion in the number of new wineries in Central Otago, and wine quality has soared. Central Otago represents just 5% of total vineyard acreage in New Zealand, and around 85% of this total is Pinot Noir. The world’s southernmost wine region, Central Otago has an extreme climate capable of producing outstanding varietal intensity and purity of flavor. With its hot but short summer, high UV light (not only is it far south but it sits under a hole in the ozone layer) and dry conditions, Central Otago tends to produce Pinots with dark fruit and floral qualities and considerable stuffing (alcohol levels are frequently around 14%); their flavors often remind me of wines from the southern Côte de Nuits (especially Nuits-Saint-Georges and Vosne-Romanée) or the far Sonoma coast. Due largely to its mountainous terrain, its main sub-regions feature wide differences in climate, exposition, altitude and soils, although a stony free-draining base rich in schist is common to most. Summers are especially warm and dry at the southern end of the Cromwell Valley (especially in Bannockburn), quite warm in Bendigo, and cooler and generally higher in altitude in Gibbston, resulting in later ripening here. Wanaka, located about 50 miles north of Queenstown, is also cool, as well as wetter. But even in very small areas, soil differences can be pronounced. Blair Walter, who makes some of New Zealand’s greatest pinots at Felton Road Winery, notes that along Felton Road, “the soil can change dramatically from pure deep silt, to pure schist angular gravel, to rounded alluvial gravels, to heavy clay and to pure sands, all in the space of two or three miles.” And of course vine age, as in much of New Zealand, represents another key variable. The overwhelming majority of Pinot Noir vines in Central Otago have been planted since 2000, and the wines can only gain in depth and complexity as the vines mature. Although there is relatively little classic limestone in New Zealand (and even less in warmer, north-facing sites), areas like Central Otago benefit from pedogenic lime, which is chemically similar to the lime in limestone but does not come from marine deposits. Rather, this lime is created in the soil when carbon dioxide dissolved in water comes in contact with calcium released from the parent material as it weathers and is chemically broken down, forming calcium carbonate. This process occurs very slowly in Central Otago because the climate is so dry. In most areas, the calcium carbonate leaches through the soil and into the ground water but in Central Otago the leaching process is rarely complete and the lime accumulates over a long period of time at the depth at which it’s washed by the water. As a result, the soils are alkaline at depth despite the topsoil being slightly acidic, a profile with similarities to limestone. Syrah is an up-and-comer in New Zealand, although it still represents barely 1% of total vineyard acreage in the country. The finest examples come from the dry, temperate Hawke’s Bay, on the east coast of the north island; this is New Zealand’s oldest wine region, dating back to the mid-19th century, and its second most important in terms of production. It is the source of the country’s best red Bordeaux blends, even if its coolish summer temperatures have always challenged Cabernet vines to ripen their grapes. Hawke’s Bay Syrahs have been ascendant in recent years, particularly those from the relatively new and slightly warmer Gimblett Gravels growing district (actually a brand created in 2001 by a number of producers and growers who owned land in this area) a few miles further in from the ocean and more sheltered from its cool afternoon breezes, as well as those from neighboring Bridge Pa a bit further inland. Gimblett Gravels was under water until the Omahu channel of the Ngaruroro River changed course in 1867, leaving behind a low-fertility, low-mineral gravel bed with greater or lesser amounts of silt, sand and clay. Since these soils drain quickly, the district relies heavily on controlled irrigation. With their generally moderate alcohol levels and usually judicious oaking, Syrahs from Hawke’s Bay are savory, peppery and perfumed, distinctly more Old World than New in style. Waiheke Island, a 35-minute ferry ride from downtown Auckland, also produces some very good Syrahs. This picturesque island is a popular tourist destination, thanks to its unspoiled beaches and proximity to New Zealand’s largest city. But it’s also an intriguing area for wine production, owing to its mineral-rich, weathered rock and the moderating influence of the sea. The long, mild growing season can support a wide range of varieties, although fall rains can make it tricky for late-harvested grapes like Cabernet Sauvignon. Waiheke Island’s wines, however, can never be cheap, as viticulture must compete with tourism (and vacation homes) and there’s a severe housing shortage on the island. Chardonnay is the second most planted white grape in New Zealand (8%), and some examples are excellent. I tasted a larger number of very good ones than ever before, and from a number of regions on both the North and South Islands. Other white varieties like Pinot Gris (6% of total New Zealand production), Riesling (1%) and even Gewürztraminer enjoy local followings but are tougher sells in international markets, which have so many better options for these wines. To this taster, the wines, agreeable as they often are, rarely show ultimate intensity and thrust, in some instances due to high crop levels, and in many cases their residual sweetness is not sufficiently buffered by acidity or mineral grip. The great majority of the New Zealand wines I tasted in the first four months of this year were from the 2015 (mostly white wines), 2014 and 2013 vintages. Although generalizations are impossible in an area spanning more than 600 miles from Auckland south to Queenstown, with countless variables of soil, altitude and exposure to ocean breezes, these three vintages were generally benign in most growing regions of New Zealand, allowing for the production of many outstanding wines. More than one producer I visited this year maintained that these three vintages represent the finest such streak for New Zealand to date. The most significant challenges over the 2013-2015 period were heavy rainfall during the second week of April in 2014, which seriously affected later-picked varieties in Hawke’s Bay down to Marlborough, and an unusually cold early season in 2015 that included widespread frost issues during the flowering, cutting yields significantly in many areas and resulting in a short crop overall for New Zealand. The very warm, dry 2015 growing season was bookended by cold conditions at the beginning and end. Cold snaps during early December caused widespread but highly variable crop losses in Marlborough; the region also had some rain during the flowering. Cool, unsettled weather during spring also held down ultimate crop levels in Martinborough. And the coldest spots in Central Otago, like Bendigo and Gibbston, suffered losses to frost. More temperate wine regions farther north, such as Hawke’s Bay and Waiheke Island, reported that the small size of the grapes cut yields. The summer months then brought high sunshine hours and near-drought conditions in some areas. The grapes were clean and intense and there was virtually no disease pressure. The harvest started earlier than average but temperatures quickly cooled down considerably, allowing the grapes to retain healthy acidity. Most growers picked at their leisure, although a few growers in Marlborough and Hawke’s Bay said that some early-April rains caused some problems and even introduced rot issues. Of the few red wines I tasted from barrel, 2015 looks to be an excellent vintage, with concentrated wines showing a bit more stuffing and breadth than usual; time will tell if they have the acidity and structure for greatness. Prior to tasting 2015 Sauvignon Blancs from Marlborough, I feared that the very warm, dry summer could have resulted in overripe, exotic or otherwise inelegant Sauvignon Blancs, but I need not have worried: the vintage is undeniably rich and deeply flavored but fresh and balanced too. These wines may be less aromatic than those from the larger crop of 2014 but they show more texture and concentration. In much of Central Otago, the early part of the 2015 harvest was cloudy and chilly, with the threat of frost in some areas. The wines appear to have a good balance of acidity, alcohol and phenolic ripeness. Meanwhile, in Martinborough, early flavor and seed ripeness allowed many growers to pick at lower than usual Brix levels. Budburst was very early in 2014 and a warm, dry spring with a near-perfect flowering set the stage for what would be the largest crop on record for New Zealand. Even in extreme Central Otago, frost was not an issue in 2014. Following the precocious flowering, growers feared that a very warm summer would have them harvesting a month earlier than normal. But the summer was mostly mild and favorable, without sustained heat; the nights remained mostly cool during the peak summer months (January and February), and for red wines tannin development could begin to catch up with fruit ripeness. Grape-growers in Marlborough in particular, where Sauvignon Blanc crop levels are typically generous, used crop thinning to moderate yields and ensure ripeness. A major tropical storm affected the North Island and the northern tip of the South Island in mid-March but ultimately brought more wind than rain. There were then some rainy spells during early April followed by another major storm, this one bringing substantial rainfall, in the middle of the month. Most of the best fruit was in by then but later-picked varieties and areas were affected, with much Syrah in Hawke’s Bay and Auckland picked around the rains and some Cabernet Sauvignon still hanging on the vines. And any Sauvignon Blanc that had not yet been harvested in Marlborough was ruined. 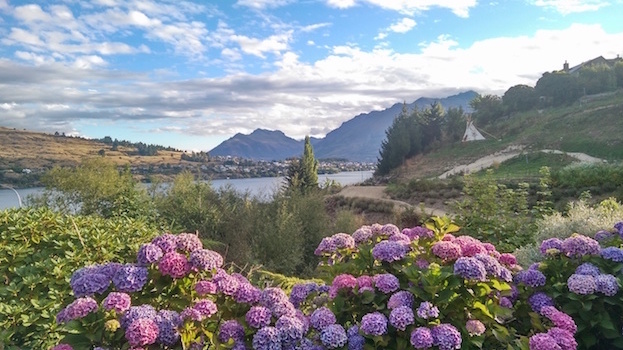 Growers in Central Otago extolled 2014’s cooler summer and slow ripening, which led to brisk, sappy wines with well-integrated tannins—and often relatively low sugar levels in the grapes. While 2014s from most areas of New Zealand tend to be aromatic overall, if there’s a downside to the vintage it was the high yields, which could produce wines a bit lacking in dimension and structure. Climatic conditions were conducive to making very good, vibrant sauvignons, provided yields were not excessive. The 2013 harvest took place mostly under cool, clear conditions and was over relatively quickly. In Central Otago, following a coolish January with some rain, February and March were warm and dry, with higher nighttime temperatures than in 2014, and the ripening process was faster. With less hang time, the wines are often fleshy and a bit softer in acidity, perhaps with a wider range of ripeness than the 2014s—and without the same refinement of tannins—but they are generally rich and satisfying. Red wines from the North Island tend to be rich and full, and producers there were thrilled with the warm, dry summer, especially after the cooler and wetter 2012. 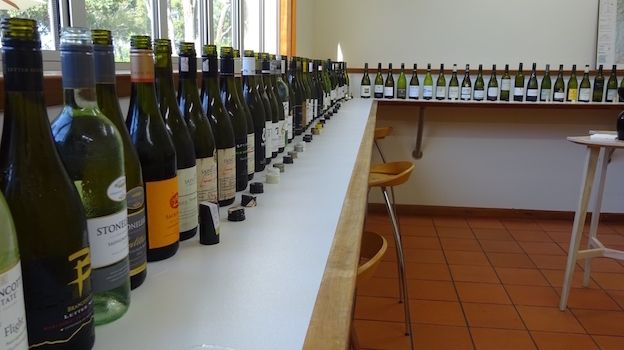 The wines I tasted from Hawke’s Bay, especially those from Gimblett Gravels, are evolving very slowly (I tasted a lot of notably backward wines), which I take as a positive sign for their development in bottle. On Waiheke Island, 2013 was an outstanding year for red wines.